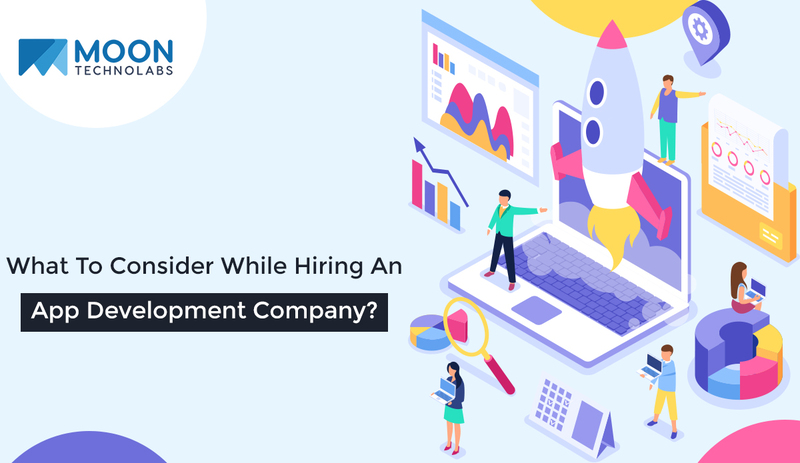 What To Consider While Hiring An App Development Company? The increased take towards mobile has accelerated the push for companies and businesses to cater their clients and customers through enterprise apps. Gone are the days when mobile apps were considered as the secondary source to increase sales, grow customer base, etc. Nowadays, every business venture is taking up the opportunity from a very early stage to provide service via mobile apps and hence, makes it necessary for them to begin the app development journey. Mobile apps have become a mandatory requirement for most of the businesses. There is a huge shift in the usage of mobile apps from desktop sites and computers. Figures suggest that not only there is an increase in the time spent on mobile apps but also more and more businesses are looking for the best mobile app development company to build their apps. It is imperative for you to check the portfolio of the company to ensure their expertise, skills, SLA and project delivery timeline. Try to check their apps in the same industry sector such as yours to get a closer look at the feel and functionalities of the developed apps. Be cautious of the companies who do not have proven track record of building apps or apps in the app store and portfolio. Is the mobile app development company taking active participation in the discussion and also providing valuable inputs with regards to your project? Do they keep communication and development channel clear while the project is ongoing? Are they able to add creative and uniqueness to your app? This is an important factor in deciding the app development company for your project. Expert mobile app development companies enable their clients’ app feature and functionalities requirements into an actual working prototype. From time to time, they also suggest an additional feature with suitable frameworks that can be implemented. It is also vital to see that the software can be integrated with other systems and workflows. Do not let the price be the deciding factor as going with the low-quality app development will not reap you enough benefits in generating revenue nor will withstand against the other better quality apps. It is crucial to have a clear and flexible budget for your project. A recent survey by Clutch reveals that an app development cost could vary from $30,000 to $700,000 which principally tells you how important is the pricing factor while choosing an app development company. There is some business who would rather prefer an app development platform than to opt for full custom development as it will be costlier. It is essential that before giving the contract to develop an app, one must understand and agree with all the payment terms and methods offered by the software development company. Some companies also offer to hire your own selected team of app developers to work on your project. It will of great significance to decide from the beginning about the platform you want to develop your app for i.e, native or hybrid app development. You could specifically base your app platform for major operating system i.e, iOS or Android or one can even ask the app development company to build a cross-platform app. The fundamentals to keep in mind is to choose a company that can accommodate your requests and has a deep working knowledge of these platforms and adheres to the app development guidelines. Nobody knows your project as you do, hence, it is of utmost importance that your involvement in the project is substantial. Make sure that the company takes enough input and feedback for the app development and presents you with the wireframes and prototypes of the same. Understand the project clarity from the company about the number of iterations, therefore your involvement is crucial for app development. Effective communication between clients and app developers is the key driving point in the success of a project. Regarding the communication, you will need to ask the company about the ways they keep the communication and collaboration with the clients. Also, the frequency of updating or providing the progress of project development. Is the company following the agile methodology? What are the project tracking tools they use? Which are the project management tools they implement? A Dedicated project manager should be able to provide clients with updates via such collaboration tools and ensure that the project is on-time. An app development company needs to establish a project timeline and needs to make sure to adhere to it. As most of the app development companies are working on multiple projects at a given time hence, it is important for lasting relationships and to maintain reputation, they should deliver the project on time. One way to ensure that is by allocating skilled, experienced and dedicated team for the project. It is pertinent to know the app submission guidelines and the policy of the company. Professional mobile app development company will either guide you or walk you through the process or even submit the app for you. A trusted app development company stays with their clients throughout the app development cycle, unlike many other companies who leave once the initial development is completed. Once the app is released, from time to time, you’ll have to release updates, fix errors and bugs or even might need to add more trending features and/or functionalities. Thus, it is in the best interest to understand the policy of app maintenance and support. You can check whether the app maintenance fee is charged on an hourly or monthly basis for the continued support. You’ll have plenty of options available for app development in the mobile market. Hence, it is extremely important to do a thorough research about the company you plan to do business and give your project. To build an enterprise-grade app, you’ll need to find a top mobile app development company that has technical expertise, good communication skills, proven track record, energetic team to help you build a successful mobile app. At Moon Technolabs, we understand your need for a successful mobile app and so we implement design and development strategies to build an app just like you want.